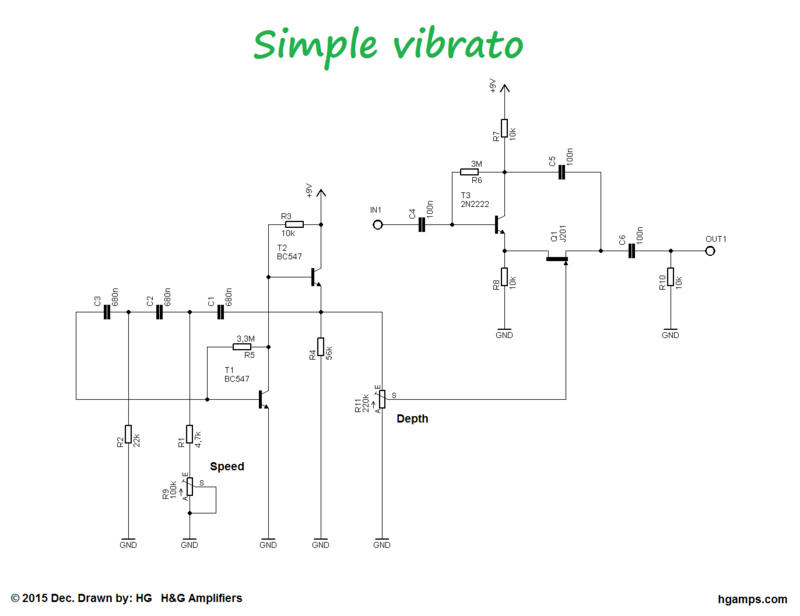 This is a simple guitar vibrato effect, used to obtain the variation in pitch. The circuit of is fairly simple. The oscillator is a standard transistor circuit, and has been used for this sort of application many times. The Q1 FET are used as a variable resistance, and although they introduce some 2nd harmonic distortion, are fine for guitar, and the distortion will be audible only with very high output pickups. The T1 transistor circuit made up of LFO. The C1, C2, C3 and R1, R2, R9 replacing members can set different default frequency. Typical tremolo LFO’s work in the 2Hz to 15Hz range. You can see the signal on an oscilloscope, but you cannot hear it ( infrasound range ). The R11 Depht control determines the amount of modulation, and is variable from zero to the maximum allowed effect.